"I've been through it all, baby. I'm Mother Courage." ....and indeed she is. She is also the most beautiful woman in the world, an accomplished actress, a loving mother and grandmother, and a selfless humanitarian. 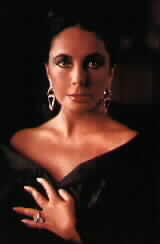 Elizabeth Rosemond Taylor was born on February 27, l932, in London, England. At the outset, she was blessed with stunning good looks and obvious intelligence. Upon returning to America, Elizabeth was determined to become "a serious actress, like my mother was". At the age of nine, Elizabeth had received her first movie contract and was featured in "There's One Born Every Minute". After a couple of films co-starring with Lassie, Elizabeth really came into prominance with "National Velvet". Unlike a lot of child actors, Elizabeth easily made the transition to adult star, and was soon being featured in ever-more-challenging lead roles, such as Maggie the Cat in 1958's "Cat on a Hot Tin Roof". Nominated for Academy Awards for several years in a row, Elizabeth finally won in 1960 for "Butterfield 8", a role she detested. 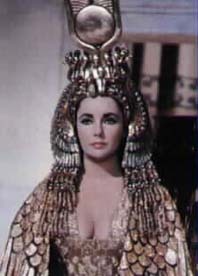 Elizabeth was the first actress to be paid one million dollars for a film role--l963's "Cleopatra". Stripped of the trappings of glamour, Elizabeth's greatest role was her dynamic performance in "Who's Afraid of Virginia Woolf? (1966), for which she deservedly won her second Academy Award. Elizabeth enjoys the status of being a true screen legend (one of only a handful), so she can pick and choose her projects. At sixty-six years of age, she is a savvy businesswoman who dedicates a lot of her time and energy to the fight against AIDS, a cause close to her heart. She accepts an occasional acting assignment (mostly television guest appearances) when the mood strikes her and and her fragile health permits. Elizabeth has indeed lived a life filled with passion, and she continues to dazzle us with her amazing courage. She is, and will remain, a national treasure.